When I write short stories for children, I like to use an animal that children can relate to at their young age. Not only that, I hope that my religious fiction stories with a fictional character using a donkey can apply to their young lives also. In addition, I figured that a donkey was also a popular animal for means of transportation in both the Old and New Testament in the Holy Bible as well. 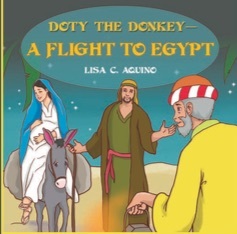 This is why I chose a donkey for my published rhyming story for children, “Doty the Donkey–A Flight to Egypt.” Also, despite the fact, a donkey was obviously used to carry Mary and baby Jesus to Egypt too. (More of “Doty the Donkey” stories to come in the near future). Back in the year of 2014, I was in my living room at my apartment watching TV drinking my hazelnut coffee. I do not know what happened that day. But I do remember it was getting towards the end of summer that year. I was on my couch and the name, “Doty the Donkey” popped in my head all of a sudden. All I could think of was how did the name “Doty” just came to mind??? I remember repeating it in my head and liked the sound of it. I have to admit that many years ago, I was in touch with friends whose last name was Doty. I do not know if that is reason why it came to my mind subconsciously or what. I looked up and typed the name “Doty” on Google. I was pleased that the name stood for “Brave and Strong.” But if you type in “doty” with a lower case letter “d” it stood for a decaying mind. I became nervous because the way my mind thinks, sometimes I thought God was telling me I will get dementia someday. Then I realize my book with the name “Doty” will always have a capital “D”, which I stated earlier, stood for “Brave and Strong.” WHEW!!! I was a bit surprised on how the name “Doty” was pronounced to me. I had so many wonderful people pronounce the name wrong. They would say the name like it was pronounced “Dottie.” In reality, it is pronounce with a long letter “O” sound. Like Doughty or something. It was really quite cute and I had to chuckle. Even the folks where my book was published said it wrong too. But that’s ok. That is all I have to say this week. Have a great week ahead and God Bless with the greatest love!!! If you like to order my book, you can go to dotythedonkey.com, Amazon or Barnes & Noble. Thank you. Previous Why Do I Write?? ?